Standard - $12.99 Only 7 left! Look. Sometimes, you just need a plastic bag full of toy snakes. We know it sounds kind of strange, but it's the truth. Sometimes you want to scare your little sister by scattering them all over her bedroom floor. Sometimes you want to confuse your cat, by sneaking up behind him and placing a toy snake by his back legs. Sometimes you're trying to dress up like Medusa and you want to put a few toy snakes in your hair. And sometimes, you're just trying to create a creepy look in your home for your Halloween party. 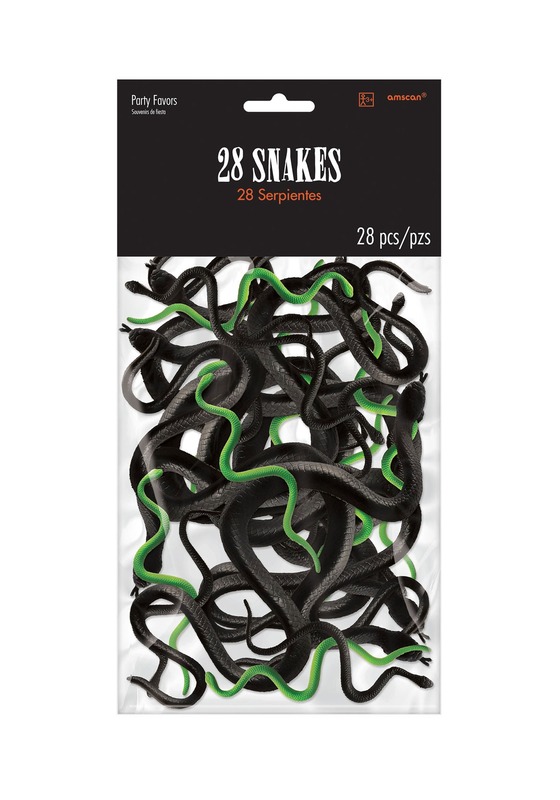 This bag of plastic snakes is for those many instances in life when you just need a bunch of toy snakes. This particular bag comes with 28 snakes. 28 snakes! Now that's a deal you can't beat with a stick! Some are black and some are green to give you a nice variety. You can use them to scare your family members, or use them as a costume accessory. You can use them to confuse your pets, or use them to decorate your home for the next costume party. When you have this plastic snakes, you will never have to worry if you have enough toy snakes in your life!